The All-on-4® treatment concept is a revolutionary new procedure that provides patients permanent attached (fixed) teeth using as little as four dental implants. Dr. Havrilla has advanced training in the All-on-4® same day implant procedure and often recommends it for patients that are about to lose or have lost all of their upper and/or lower teeth. Your new teeth are cleaned with brushing just as natural teeth would be. No nightly removal or adhesives are needed. Your teeth will be comfortable again. 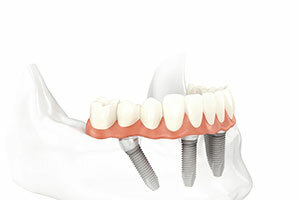 No more slipping or misfit dentures. You will experience the temperature and taste of your food again. You’ll have renewed chewing force. You’ll be able to eat your favorite foods again. You’ll look years younger with restored facial features. The traditional approach to restoring a full arch of teeth usually involves bone grafting to provide a base for the implants, six or more implants and treatment time as long as a year and a half. The length of treatment often meant that patients would be left with an ill-fitting denture or missing teeth for a year or more. With the All-On-4 Implant Procedure, only 4 implants are placed. Additionally, because these implants are specially engineered to take advantage of existing bone, bone grafts are normally not necessary. Because there are only 4 implants and bone grafts aren’t necessary, the treatment time is dramatically lessened. 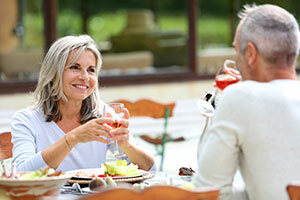 Consequently, the All-On-4 Implant Procedure is much less expensive than traditional implants. If you already have dentures, or are looking at the possibility of losing your teeth due to advanced periodontal disease, or other factors, the All-On-4 Implant Procedure is the ideal treatment option. It is proven and cost effective. And it can give you a lifetime of happy, healthy smiles. With this advanced technique, we can provide you with a full set of implant retained teeth in a single day. What will my new teeth look like? Your teeth will look, feel and function more like natural teeth. No one will know that you have implants. If you are currently wearing dentures or are missing teeth, you will shave years off of your smile.